With the final woodworking plan material drafts completed, I thought this would be an opportune time to formally introduce the woodworking community to one of Klockit’s most ambitious plan projects to date. Picking up where the “Project Delaware” blog post left off last month, I am very proud to introduce / re-introduce the Delaware Grandmother Clock! Long-time Klockit customers are no strangers to the Delaware clock assembly. Klockit carried the Delaware as a kit (only) in the 1990’s and 2000’s. To date, it was one of the more successful kit products we offered, and demand for a woodworking plan version was constant. As wood prices increased, the Delaware became too expensive and labor-intensive to produce in kit form, and was discontinued. The possibility of a plan version was moved to the “back burner” of the product development list and remained in this state for a number of years. Over the past four years, we continued to receive requests for a pinched waist floor clock. While a kit version can take the better part of a year or longer to develop, woodworking plans can be introduced just as soon as the final design is ironed out and specifications are applied. Thus, the original Delaware engineering drawings were pulled out, dusted off, and reviewed. We also dug deep within the Klockit comment card archives to review design changes and suggestions offered from customers who had purchased the kit version in the past. From there, the clock cabinet design was updated and the plan specification drawings were created. Long-time Klockit customers can rest assured… the new Delaware design will still include all the main features that made its predecessor so successful! Perhaps the greatest feature of the original Delaware clock was the fact that, typical of many pinched waist designs from the past, the hood cabinet is completely removable from the case. This allows uncompromised access to the mechanical movement within and ease of any required movement adjustments during the set-up and regulation process. To improve upon the assembly, changes were made to the back and floor panels to make them ½” thick for increased strength. The upper hood assembly was re-designed so that the clock face will seat directly in front of the dial board panel and so that the case can accommodate one of two different mechanical movement options. Finally, revisions were made to the base cabinet assembly to increase the height, making the clock more proportionate between base, waist, and hood cabinet assemblies. What Can You Expect From the New Delaware Plan? I am really excited because this is one of the more ambitious woodworking plan development projects Klockit has tackled since completion of the Mora Grandfather Clock Plan a few years prior. The Delaware clock plan will include a 70-page construction plan booklet which will cover all specifications for every wood part, detailing each part in (at least) two orthographic views. The plan will also elaborate on machining suggestion steps for the more complex parts, and will include router bit recommendations to provide woodworkers with as much material as possible to achieve profiles as illustrated. As a final note, the plan will even include upper and lower glass panel specifications for ease of sourcing with local glass retailers. As with all our plans, the Delaware will include a step-by-step written assembly instruction booklet which will be used in conjunction with a separate step-by-step illustrated assembly booklet. 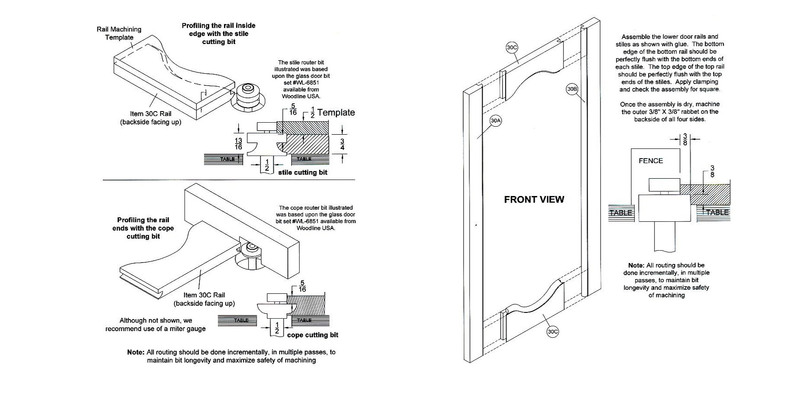 These fundamental documents will guide woodworkers through assembly of the entire case from beginning to end (to include movement and chime mounting). The final booklet included with the plan will encompass full scale trace templates and machining templates for those wood pieces that are more complicated to make. Full-scale templates and/or machining templates will be provided for the arch cut-outs of the waist and hood door frame openings, the arch cut-out of the upper and lower door arched rails, the dial board cut-out, the crown front plate, front ogee swan-neck crown molding pieces, the decorative base molding cut-out, upper and lower door glass panel arches, and the finial. A supporting component package, containing all the necessary hardware required to complete assembly, will be offered in conjunction with the plan package. This will include hinges, surface mount lock, key, key-plate (or escutcheon), turn-buttons, knobs, door catches, leg levelers, and all necessary fasteners for assembly. Look for the Delaware Grandmother Clock Plan – Available soon exclusively from Klockit! 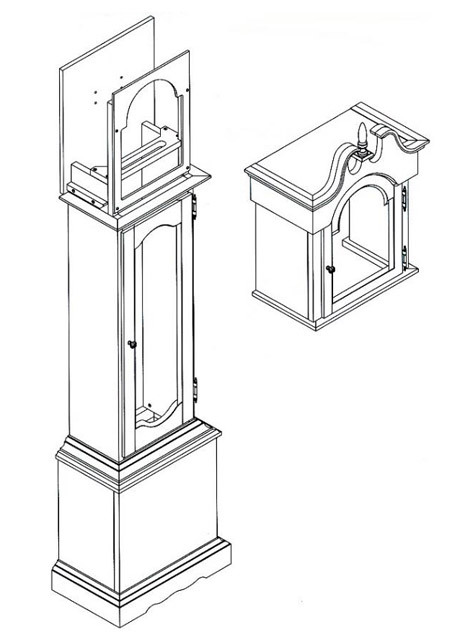 Click the image above to view sample pages from the Delaware Grandmother Clock Plan, illustrating machining of the upper/lower waist door rails (left) and sub-assembly of the lower waist door (right).